If you want a special Doctor Who blanket then this velveteen blanket could be the one you where looking for. This blanket shows an detailed image of the Tardis as an angle so that you see the front doors and one side but you can also see other details like the light on top of the Tardis. And this Tardis image stands in front of a blue funky looking background that also says Tardis on it. 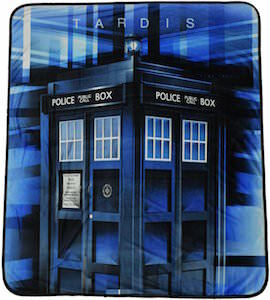 If you want a Doctor Who throw blanket then this 50 x 60 inch blanket could be the perfect fit for you and your home.